#GirlConnected – a powerful documentary film about five inspiring girl leaders from five countries around the world, took Koen Suidgeest and sound recordist Tjodi van Elk to Kenya, Peru, India, Jordan and Bangladesh. In this blog series, Koen shares some of his experiences from the making of the film. 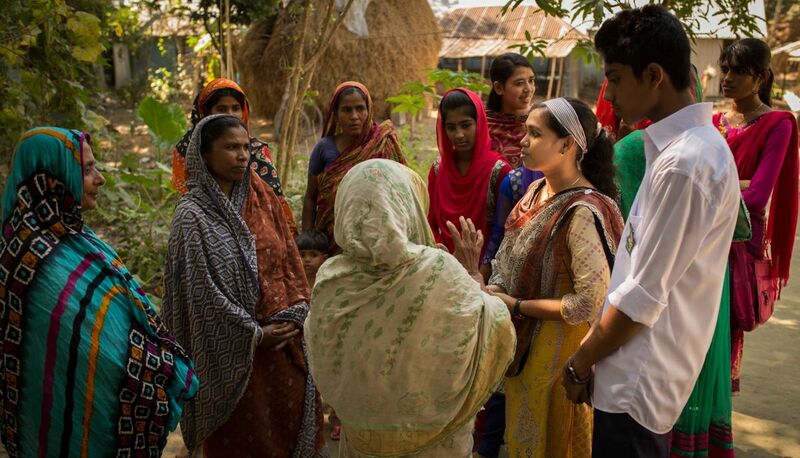 During our time in Bangladesh we learned the country is at a turning point. No one told us. We simply saw it with our own eyes through the story we set out to film. Latifa is only 14 years old. She is the second in a group of six siblings. Her father is a rickshaw puller and provides the family’s only income. Two years ago, an older man proposed to Latifa. Her parents were not so sure about the marriage, but being poor put them at a disadvantage. The suitor was a friend of the landlord of the tin shack they rented. The landlord said the family would have to leave if they didn’t accept the wedding proposal. Unwilling to accept the proposal, Latifa went into hiding for some weeks, sleeping on people’s floors until she could seek out help from her teachers and the school administration. After a hastily-set-up court case that took place at her house, Latifa was able to reject the proposal from her suitor. When thinking about Latifa’s scenario, the thought of my life at twelve years old in comparison to her life is vastly different. I had just started secondary school, made new friends and secretly tried cigarettes and beer. Not long after, I fell in and out of love for the first time. Of course I ended up studying exactly what I wanted to and when the right love came around, we started a family on our own terms. Latifa was about to be robbed of an opportunity to continue secondary school, let alone university. She would have never been able marry a person on her terms. She knew it and did the only thing she felt was right: she chose the hard way and escaped at a very young age. Today, only two years later, she is continuing secondary school and dreams of becoming a doctor. The family moved to a new house and though they are financially poor, her family is rich in love. Most importantly, her parents support her in what has become Latifa’s passion. In her free time, she founded and leads a group of volunteers from her school whose members aim to create awareness against child marriage. They go from village to village knocking on doors to talk to parents about the future of their daughters. Often they have to argue with them, “Who else is going to feed her?” they say. “How will we be able to continue to take care of her if she stays at home?” Once she personally stopped a child from marrying someone by a matter of minutes, simply by standing in the way of a signature and calling the police on her phone. Child marriage is illegal in Bangladesh, but it’s widely practiced by lying about the girl’s age to the clerk at the town registry. When you hear Latifa argue with the adults, you’d think she was 18. She holds her own with strong arguments. Respectful of her elders, she still openly opposes many of their views by reasoning. Some agree with her and become the fertilizer of the seeds she plants for a new future for the girls in her area. Then as she walks on to the next village, a duck crosses her path. She starts chasing it with a friend, giggling their way through the high grass. You look at her then and she’s twelve years old again, living the moments she missed when she went into hiding, fearing for her destiny. It’s this turning point we witnessed that young boys and girls are becoming aware of the contradiction between their traditional past and their desire to follow their dreams. It’s Latifa’s generation that is starting to trigger this change. And by taking one step at a time, fueled by their own experiences, they are achieving it.